Global Forum on MSM and HIV - "A new report released today by the Global Forum on MSM and HIV (MSMGF) in collaboration with the Global Platform to Fast Track the Human Rights and HIV Responses with Gay and Bisexual Men and the Free Space Process argues for consistent and robust reporting on HIV in the Voluntary National Reviews on Sustainable Development. Titled “Getting on Track in Agenda 2030,” the report is released ahead of regional meetings commencing this month in preparation of the annual High Level Political Forum on Sustainable Development. 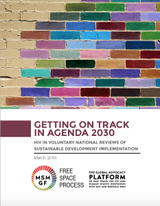 The report calls upon UN agencies, Member States, and members of civil society to collaboratively ensure HIV-related data is included in the framework of Agenda 2030."